Mint and chocolate make an awesome team. Probably only second to chocolate and peanut butter in my book. 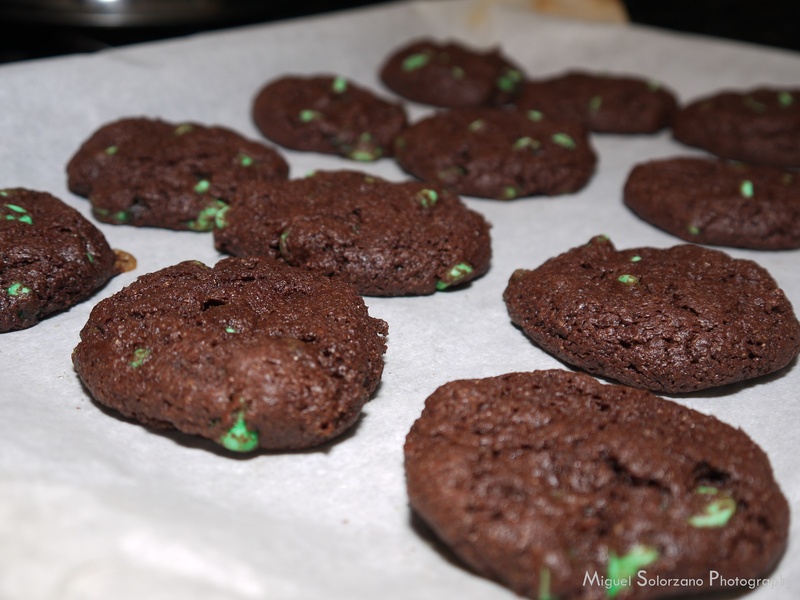 These Mint Chocolate Chip Cookies are made with whole wheat flour. Trust me when I tell you, you won’t miss the white flour. 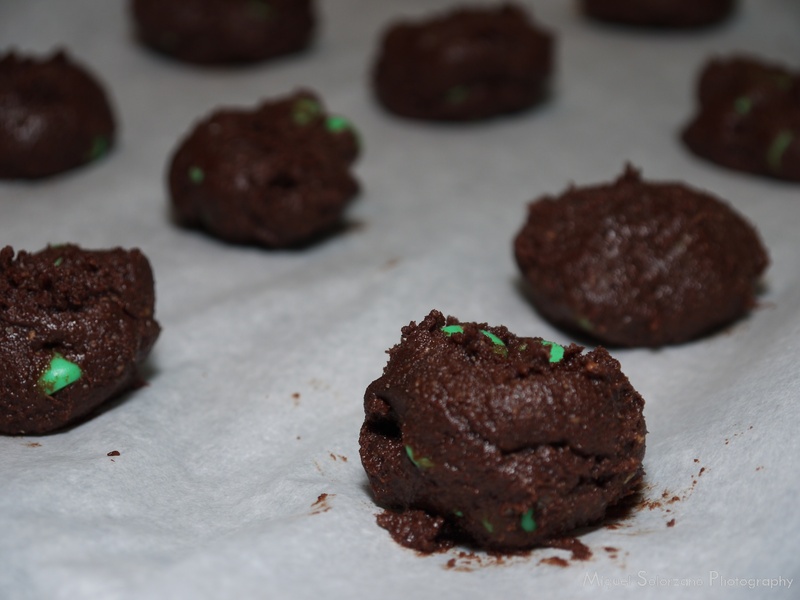 The green mint chips pack a lot of minty flavor, but it’s balanced out well by the semisweet chocolate morsels. I happened to find the mint chips at World Market by accident, but I’m sure chopped Andes Mints will work just fine. Mix together flour, baking powder, baking soda, salt and cocoa in a medium-sized bowl and set aside. In a large bowl, whisk or mix together the eggs, butter, sugars and vanilla extract. Add the flour mixture into the butter mixture in two batches, adding in the milk between batches. Use a flat wooden spoon to work in the mint and chocolate chips. Scoop the batter onto the parchment paper-lined baking sheet in about 1-inch rounds. Pat down gently then bake for 15 minutes. Remove cookies from oven to cool for approximately 3 minutes. Serve. You can make the batter in advance and store in the refrigerator for up to two days before baking. Just make sure to wrap it in parchment paper so it doesn’t dry out. 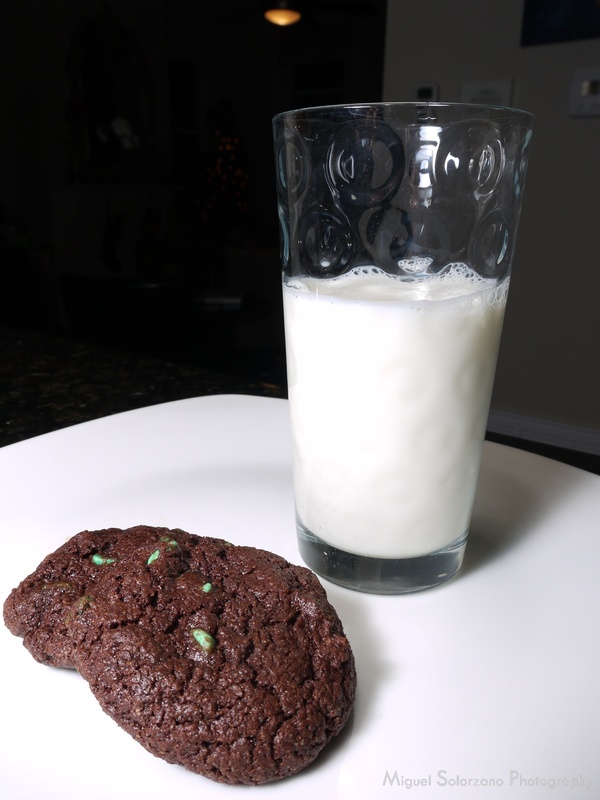 Even though I’m not a big chocolate fan, these cookies are great for the holidays and the green in the mint chips give them a nice pop of color. If mint’s not your thing, you can substitute any flavor of chip you can get your hands on. I’m thinking peanut butter chips would go well with this batter. mint and chocolate is one of my favourite food combi!